Tell that special someone how much you love him on Valentine's Day with a romantic gift that was made by you. Giving such a gift is more personal and meaningful than a store bought item, as it is a one-of-a-kind token made just for the recipient that comes from your heart. 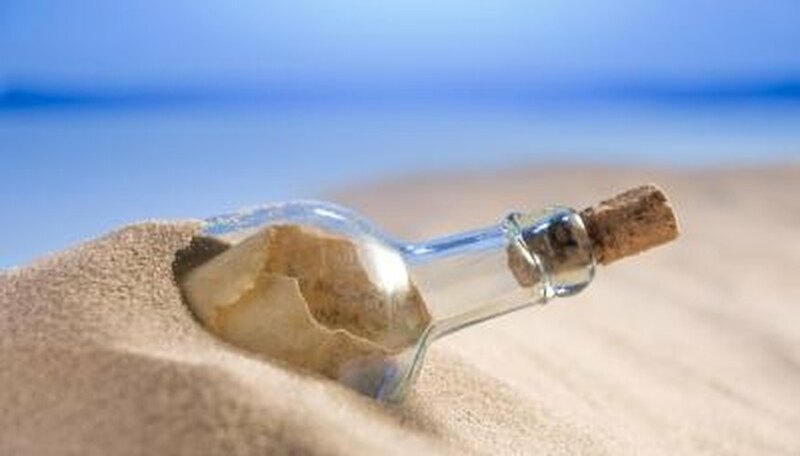 Share your feelings with your beloved through a message in a bottle. From a craft store, purchase a glass bottle as well as a cork to close it. Give a white piece of paper an aged appearance by steeping a tea bag, ringing it out and rubbing it over the paper. The tea will turn the paper a light shade of brown. Once the paper has dried, profess your love for your Valentine on it. Roll the paper up, tie a piece of twine around it and slip it inside the bottle. If you'd like to add more visual appeal to the gift, add heart confetti or torn pieces of red raffia inside the bottle. Another idea is to use paint to embellish the outside of the bottle with hearts. Place the completed gift in an inconspicuous spot, but one where your loved one will find it. Give your loved one a book filled with love quotes for Valentine's Day. Buy a decorative journal from a stationery, department or craft store. On the pages of the journal write famous love quotes and love poems. For instance, you may include Aristotle's quote, "Love is composed of a single soul inhabiting two bodies," or Sara Bernhardt's, "Your words are my food, your breath my wine. You are everything to me." If you have a way with words, you may wish to include a quote or a poem that you have penned yourself. Give your sweetie a book of love coupons for Valentine's Day. Cut red and pink construction paper into even-sized squares -- cut as many squares as you will need for the coupons. From red or pink card stock, cut two squares that are slightly larger than the construction paper squares; these will become the front and back cover of your coupon book. On the construction paper squares, use markers to write your coupons, such as "Good for One Massage," "Good for One Back Scratch" and "Good for One Dinner of Your Choice." Embellish the coupons with heart-shaped stickers and drawings that depict the activities you have named. Organize the coupons in a neat pile and place one piece of card stock on top and one piece of card stock behind the pile. Punch two holes in the left side of the pile of papers and string a piece of raffia through them. Script, "Coupons of Love" on the front cover of the book. Your Valentine can redeem the coupons whenever she wishes. Mae, Lily. "Valentine's Day Craft Ideas for Romantic Gifts." Dating Tips - Match.com, https://datingtips.match.com/valentines-craft-ideas-romantic-gifts-7383511.html. Accessed 19 April 2019.